Climate change is no longer a whisper in the wind. It has come to the forefront of the global and political stage and companies are taking action. Nike, Walmart, Goldman Sachs and Procter & Gamble are among the handful of major corporations that have now pledged to sourcing 100 percent renewable energy, according to The Guardian. The companies took this step in conjunction with New York's upcoming climate week. While the change will not happen overnight, every company has a unique plan that outlines a gradual shift to using only renewable electricity. This comes as a part of a global campaign called RE100. RE100 is "an ambitious global initiative to engage, support and showcase influential companies committed to using 100 percent renewable power," as stated on The Climate Group's website. Launched in 2014, RE100 boosts an impressive pledge list with big names including H&M and Starbucks. This shift will require some significant strategic sourcing work on the part of these companies, but the effort will be beneficial for more than just the environment. While the cost of transitioning to renewable energy sources can be considerably high according to The Economist, the benefits of this switch can pay off in other ways. Responsibly sourcing your energy can be translated into one simple word: sustainability. When you tie the word sustainability into company practices, you get great responses from consumers and shareholders alike. 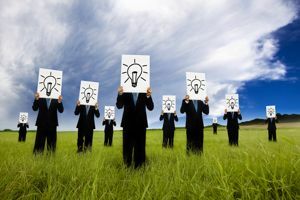 McKinsey & Company, a business advising firm, reported that 76 percent of executives say sustainability "contributes positively to shareholder value in the long term." Another 50 percent of companies saw near immediate value creation within their businesses. In a different report, McKinsey & Company found that while working with your suppliers to become more sustainable can overall be a more difficult process it ultimately results in profitable gains. In a similar vein, a study by Nielsen found that globally, 55 percent of consumers are willing to pay more for products produced by companies with a commitment to positive environmental impact. Even more noteworthy is the fact that the 55 percent figure represented a 10 percent increase over the same measure only three years earlier. Sustainably sourcing your company is a great way to promote not only good values but perhaps increased revenue. So follow in the footsteps of Nike and Walmart and who knows? Maybe you'll be a multimillion dollar company someday too.